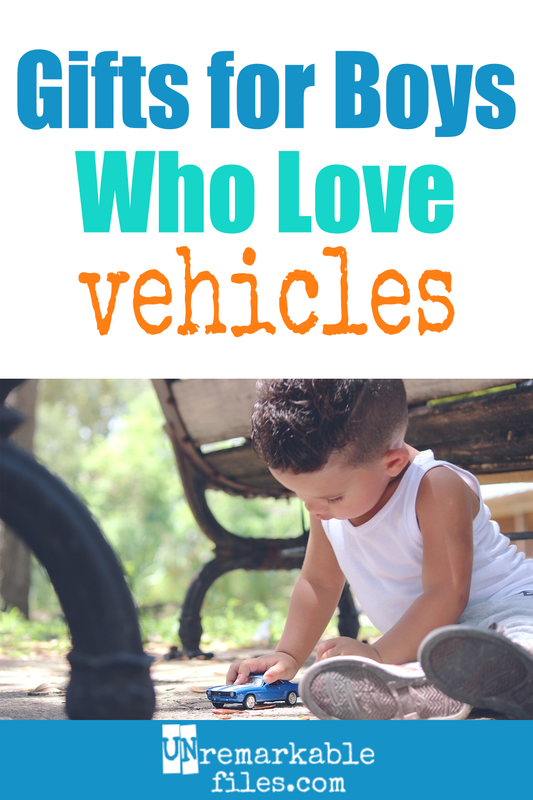 If you've got a kid who loves things that go, then you're going to want to print out this list and frame it. 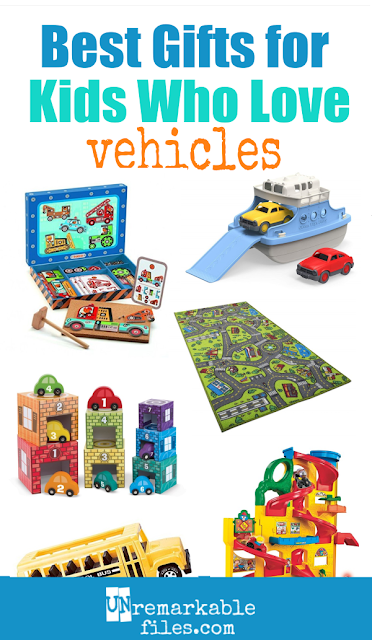 Over the years our family has used all of these toys, which have not only been instant hits with our boys but have also stood up to lots of heavy use in our family of 8. Several years ago, my son discovered this at a friend's house and all of a sudden she was his best friend in the world. While he probably liked her alright, I'm pretty sure he was just using her for her Little People car ramp. 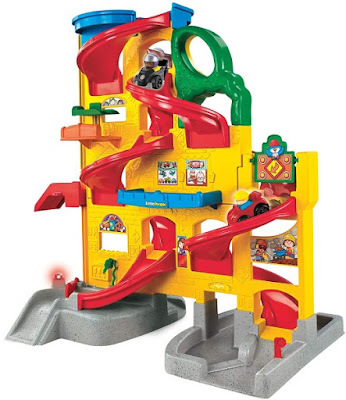 This thing would entertain him for hours, at over 2 feet tall with two spiral hid-and-seek ramps that are sized for Little People cars but will work with any matchbox car. Batteries are optional in my opinion: even without the lights and sounds, this toy car ramp is still amazing. This toy combines the first true loves of my second son: vehicles and hitting things with a hammer. 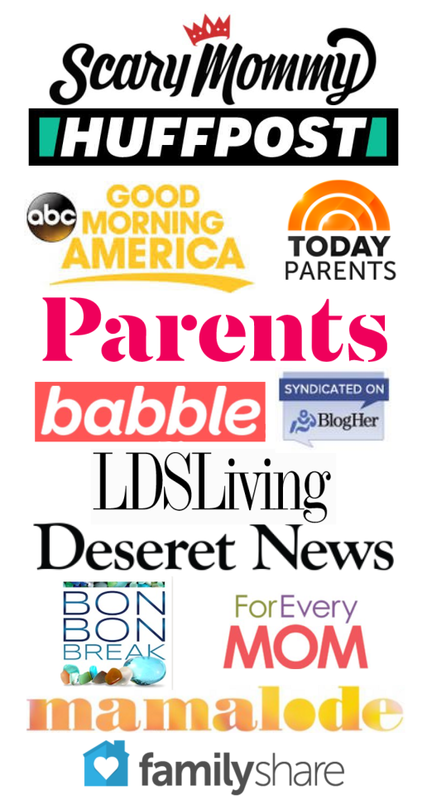 And from a parent's perspective, it's pretty awesome, too. Kids develop fine motor skills while placing the little tacks and aiming the mallet. They work on matching to make the pictures on the cards or creativity to make their own vehicles. You'll need to supervise clean up a little to make sure all the tacks go back in the sturdy box (a box that won't fall apart is a big deal to me!) but the tacks themselves don't pose a safety risk because they aren't very sharp and slide easily into the corkboard surface. My mother-in-law first saw this toy being played with at a children's museum and knew that it was durable enough for a children's museum, it was durable enough for our household. 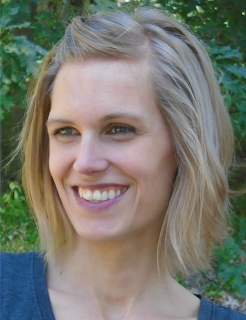 She was right. 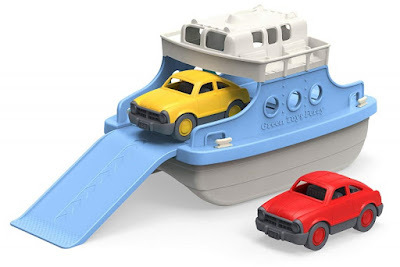 Green Toys are excellent quality (we also have the helicopter) and our kids have hours of fun driving the cars up and down the ramp of the ferry. We use ours as a playroom toy, but you can also take it in the bathtub, so it really doesn't get much better than this. 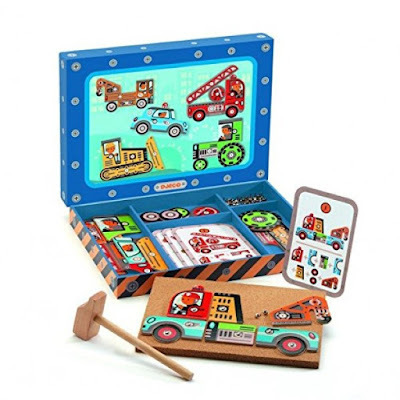 Your preschooler who loves trucks will spend hours assembling and reassembling this giant 24-piece floor puzzle. 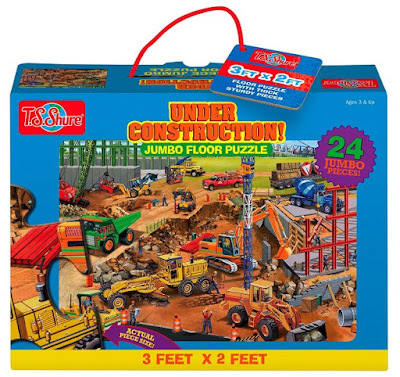 The puzzle measures in at 3 feet by 2 feet, and the puzzle pieces are sturdy enough that even though it's played with practically daily in our house, it's still looking good a year later. At the same time, we also bought the T. Shure railroad puzzle, which is just as amazing if your child also happens to love trains. 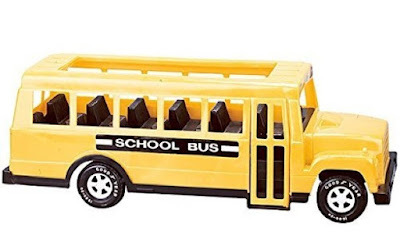 When our toddler went through a phase where was obsessed with buses, we searched the Internet high and low to find him this plastic school bus. It's not just any bus! Most we saw were too small for toddler hands and too easy for things to get stuck inside, but at 18 inches this is big enough for some special play and the open top makes it easy to put things in and take them out without frustration. We knew he'd love it, and were proven right when he got up early on Christmas morning and started playing with it before we were even awake. 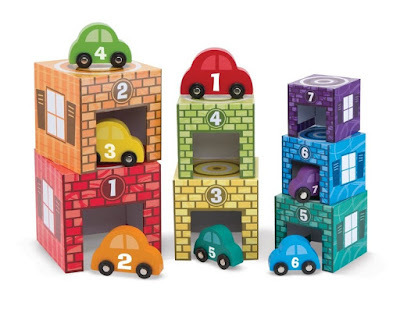 Durable wooden cars, colorful garages you can stack and arrange in multiple configurations, opportunities for teaching numbers when they're playing... what's not to love about these Melissa & Doug garages? When we first received these, I was a little disappointed that the garages were heavy cardboard instead of wood, but after seeing how my toddler likes to stack them high and send them flying sometimes, I think that's actually a good thing. While my boys own plenty of matchbox cars, these are unique in their collection. Not only are they vehicles you don't see everywhere (I don't think we've ever owned a street sweeper before,) but these chunky, durable cars do cool things with no batteries required. Pushing the car is all you need to make the combine reel spin, the sweepers activate, or the cement barrel roll. My boys and I love these vehicles. 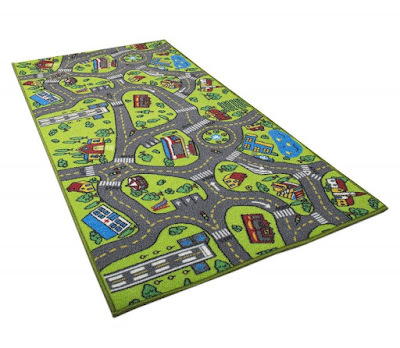 You know you already have too many matchbox cars, so put them to use with this rug! I promise you'll be shocked at how much time a kid can spend driving toy cars up and down these winding roads making vehicle noises. There are a lot of car mats out there of all sizes, but I especially like this one because at 60" by 32", it's a good size and shape for multiple kids to play on without taking up too much space in the room. Buying toys for a kid who loves trucks, trains, cars, and things that go can be hard — after all, they have a lot of them already! 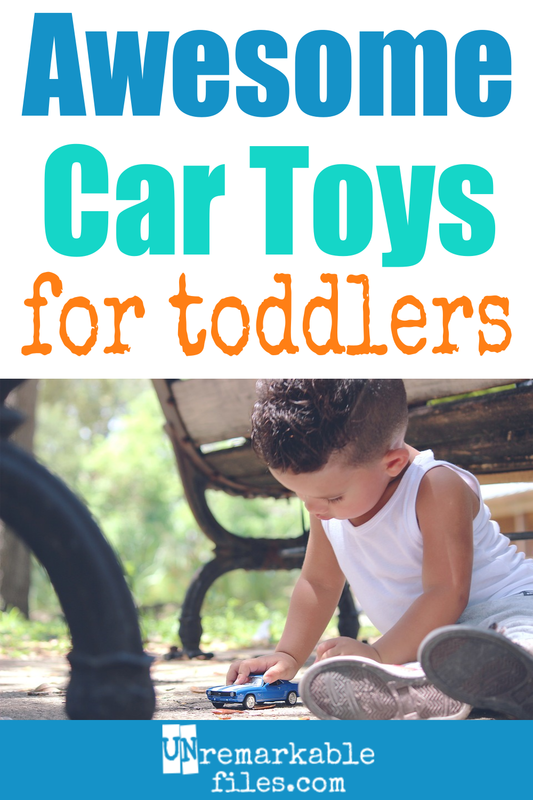 But it's also really fun, and these great vehicle toys are sure to delight and hold up to years of heavy play. These are awesome! I just put a couple f them aside for future birthday ideas. 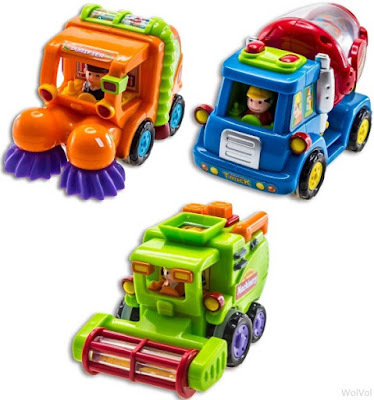 Any recommendations on mechanically - minded / building toys? I need to write one of those, because our 10-year-old is really into robotics and engineering so we've gotten quite a few of those over the years. Have you ever looked into Snap Circuits?